On September 27, Makenzie and Steven Schultz were getting dinner in a Cedar Rapids sushi restaurant and were served by a desperately overworked waiter. The couple say he was in charge of 12 tables and, although he stayed pleasant and apologetic throughout the night, it took 20 minutes to get them water and 40 minutes for appetizers. Fortunately, the couple had met while waiting tables at a Bubba Gump restaurant, and knew that, sometimes, the night is just not conducive to great service. 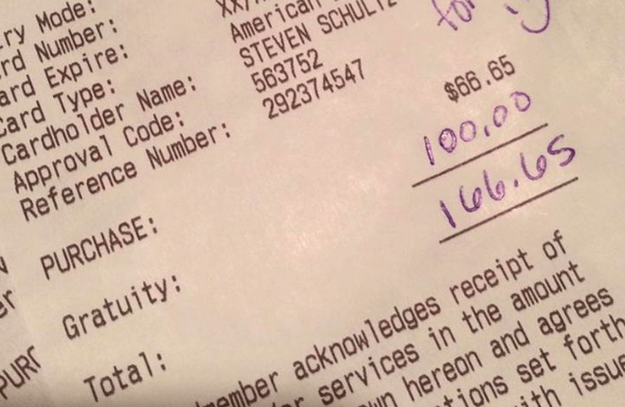 So they, awesomely, chose to tip their water $100 on a $66 tab, and left him a note saying they’d been in his shoes.